Racism in Moldova – Fiction or Reality? Love and hate, tolerance and intolerance, friendship and betrayal – they all live in us and influence our behaviour. They cause wars and unions, make people hurt or respect and love each other. What would you choose: happiness or pain, peace or sufferings? These are not just words – that is the way we treat other people, the way we want to be treated. It’s vital for us to be a part of the society we live in – we need to feel comfortable in it, as we have very strong links with it, we depend on it. And now imagine that society doesn’t want to accept you. Other people laugh or stare at you. Imagine that you cannot walk calmly down the street, as you are not sure whether you are safe or not. It happens just because you have the “wrong” skin color, the “wrong” religious believe or you speak the “wrong” language. But this is not your “fault”, isn’t it? On 26th of October, students of journalism at the Moldovan State University (USM) organised a conference concerning “Football against Racism”. Eight representatives from NGOs such as “Fatima”, “The Centre for Refugees”, “The Tolerance Club” came to say “NO” to racism, “NO” to violence and discrimination. During the discussion panel, the participants shared their personal experiences related to the issue of discrimination and suggested their methods of solving this problem. Nnadi Daniel Uchenna, professional Nigerian footballer at CS Mipan FC, said that he did not know about the issue of racism, until he arrived in Moldova. His own coach racially abused him in his former club in Moldova. In other cases supporters or opponent players openly insulted and offended him while playing. He thinks that it is important to keep calm on the pitch, but directly confront racist players after the game and “educate” them. For Daniel we are all created equal, and regardless of the nationality or the skin color, we should treat each other with respect. Tom Gassler, who is an Austrian journalist and part-time football fan, informed us about the problem of discrimination in Austria. “A few years ago a player from Burkina Faso (West Africa) came to our football club and told us about racism he has lived through. His story has inspired us to create a music CD of solidarity, called the “First Half Time for Burkina Faso”. I believe that with the unity of music and sport we can make a huge step towards solving the problem of racism”, said Tom. Dr. Keita Abdramane, leader of the African NGO “Fatima” in Moldova, agreed with Tom, “We consider football the main tool that contributes to unite children of different races, nationalities and cultures. 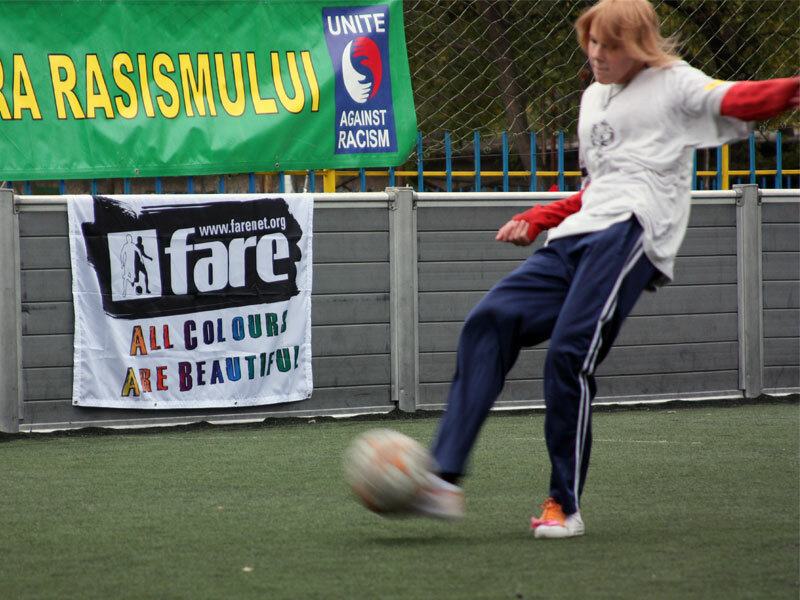 If our children will grow up and spend time together, the problem of racial differences disappears.” In the frame of the 10th European wide Football Against Racism (FARE) action week, Fatima organised a “Day of Mini-Football” in the stadium of Sculeni in Chisinau on Saturday, 24th of October. For Keita Abdramane, who organises anti racist football events each year, the priority was to give everyone the possibility to participate. “We especially invited two female teams, two teams of disabled children and a team of Roma children. We want all people to share our passion for the beautiful game, and to show racism and discrimination the red card”, said Abdramane. As a highlight of the antiracist action the president of Fatima distributed T-Shirts, footballs, caps and posters among the mostly young participants. Javid and Salif, two representatives of the Centre for Refugees in Moldova, said that first of all, people should realise that the problem of racism still exists today. Each family and the society as a whole should help to eliminate racial stereotypes and educate children in a spirit of tolerance. Alexei Tulbure, the representative of the Helsinki Citizens Assembly, optimistically said that the Republic of Moldova is on the path of democratic reforms. Changes are slow, but – most important – they are in progress. The society and each single individual must contribute to resolve the issue of racism and discrimination. Kick racism out of football by clicking here!